The summer season has started. High ambient temperatures with humidity can have various effects on the body, the most common of which are due to heat injuries and dehydration. The most serious among these conditions is heat stroke. Classic heat stroke is also known as Severe Hyperthermia. The usual body’s temperature ranges between 36.0C to 37.5C. When the body’s temperature reaches more than 37.5C, it is called hyperthermia. It is called severe hyperthermia if the body’s core temperature reaches 40.0C. Hyperthermia is not equivalent to fever. Hyperthermia is the elevation of the body’s core temperature that is due to failure of thermoregulation. On the other hand, fever is the elevation of the body’s temperature as a response to an offending foreign body, infection or inflammation. The body regulates temperature by balancing heat load and heat dissipation. Heat load comes from internal and external sources. Internal sources of heat are mainly due to the metabolic processes of cells. External heat is due to the absorption of heat from the environment. The body should be able to dissipate the excess heat both from internal and external sources. If these heat sources exceed what the body can handle, the body’s core temperature increases leading to heat stroke. 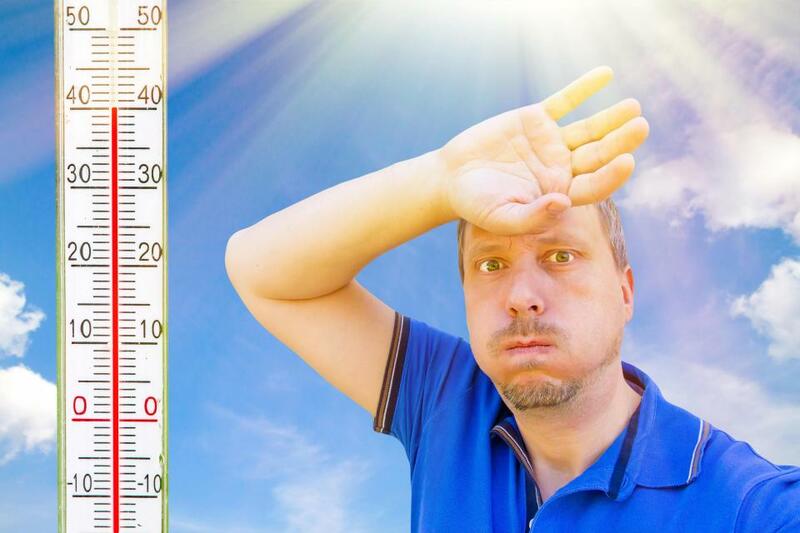 So during the summer months, when the environmental temperature goes up, sometimes reaching 40.C, the risk of heat stroke increases. Heat stroke is also different from a stroke. Stroke is due to a blood clot or bleed in the brain in people with uncontrolled hypertension, high cholesterol or diabetes and usually manifests as paralysis of part or half of the body and is not due to heat thermoregulation. But heat stroke can cause stroke. How? When the body’s core temperature increases, heart rate and blood pressure might also increase and if a person has uncontrolled hypertension, the additional increase in his blood pressure will hypertensive crisis leading to a bleed or hemorrhage in the brain called a stroke. Who are at risk of heat stroke? There are 2 major types of heat stroke. The Nonexertional Heat stroke usually affects individuals who are elderly, with chronic medical conditions or those taking medications that increase their risk of dehydration. The other type is the Exertional Heat stroke which generally occurs in younger, more active people who engage in activities during high ambient temperature and humidity. So anyone can actually suffer from heat stroke – the elderly or the young, the frail or the healthy, active or sedentary. What is important is to prevent it from happening or if it happens, to recognize it early and manage accordingly. Heat stroke is a medical emergency and treatment should not be delayed because it might actually cause death. What are the signs and symptoms of heat stroke? The signs and symptoms of heat stroke are not specific but easily detectable. Patients with a history of being exposed to heat or staying out on a very humid day should be suspected of having a heat stroke if they complain of a headache, fatigue, weakness, cramps, dizziness, palpitations, blurring of vision, or faintness. Heat stroke is highly considered in these individuals if, on further examination, their body temperature is more than 38.5C, heart rate is fast, blood pressure could be low or high, with decreased sensorium, confused or with strange behavior. 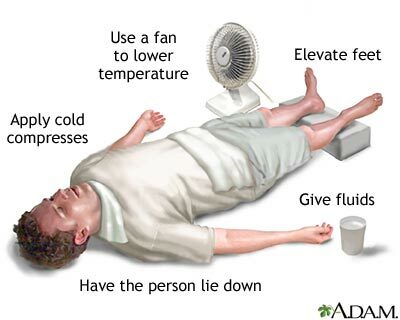 What to do in patients suspected of having a heat stroke? In case you highly consider that the person is suffering from heat stroke, you have to bring him to the nearest clinic or hospital because he may deteriorate further. While waiting for medical help, you should keep him in a cool place. Let him rest, preferably lying down in bed. If awake and able to drink, give plenty of fluids as much as he wants, preferably water. If the temperature is really high, provide sponge bath with cold water. It is also important to ask if the person has any medical conditions that might explain his symptoms such as hypertension or diabetes. In the hospital, severe hyperthermia is addressed by lowering the body’s core temperature with ice bath, intravenous hydration, close monitoring, and medications as well as addressing other medical issues of the patient. How to prevent heat stroke? Stay indoors. If you don’t have an important thing to do outside, just stay indoors. Stay in a cool well-ventilated place. If you must go out, wear protective gears like hats, sunglasses and use umbrellas. You may also wear clothes that are light and airy like cotton shirts and dresses that could aid in the evaporation or dissipation of body heat. Stay hydrated. Drink lots and lots of water. 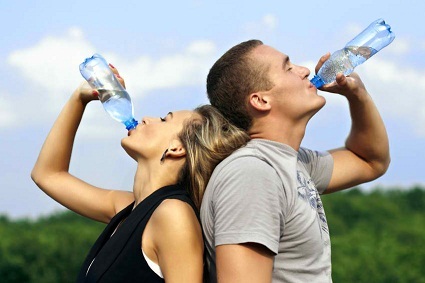 2 liters or more of water daily is advised when it’s hot and humid. Water is the best source of hydration especially if you have hypertension and diabetes. But if you are young and healthy, you may also opt to drink juices and other liquids. Eat healthily. The risk and complications of heat stroke will be reduced if you are in good health. Heat stroke is highly preventable. Just observe the necessary precautions and follow the advice mentioned above.